In another notable step, Ant-Man and the Wasp guest-star this issue - which means that the FF have now met Ant-Man, Spider-Man, and the Hulk. They really are the cornerstone of this fresh Marvel Universe! When the four start experiencing episodes of being shrunk down to just a few inches in height, they call in the Astonishing Ant-Man for advice and assistance, who not only gives them some of his shrinking & enlarging formula, but later on bails them out of trouble when they need it. 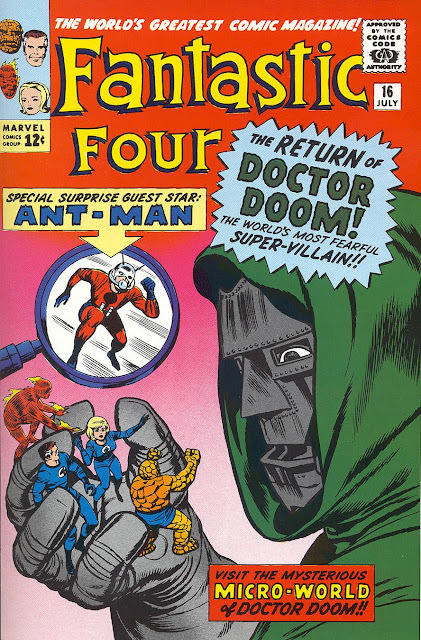 This also means that Dr. Pym is the first non-FF character to go up against Doctor Doom; will this be remembered when the Avengers have their first run-in with the armored tyrant? You've gotta admit: That Thing's pretty darn cute. When one begins to learn about atoms and chemistry in school, it's easy to be struck by the planetary model used to describe the nucleus, electrons, etc. In fact, sometimes the fact that this is just an analogy useful for conceptualizing is glossed over, and we can start to think of the atoms - the building blocks of of matter - as actually possessing that innate structure. From such a simple misunderstanding, it's then easy to make the leap to the "worlds within worlds" idea, leading to stories such as these. 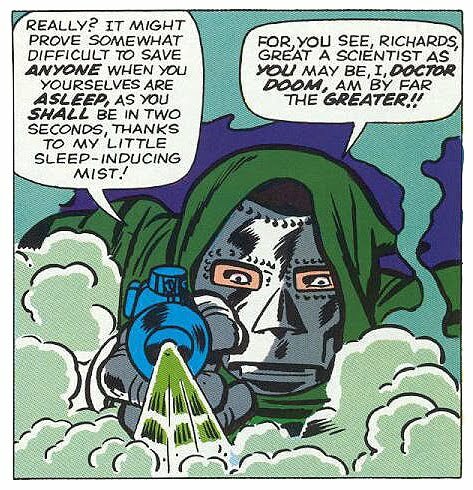 At the end of his last appearance, Doom was shrunk down - by his own mislaid schemes - to apparent nothingness. Here, we discover that it actually shrunk him down to a different world! This idea would be used again and again by Marvel - in particular, their toy tie-in comic The Micronauts would spend most of its seven-year run in a similar kind of "Microverse" - but, upon reflection, it does seem unusual that such a fertile idea would have been planted here, rather than in the more appropriate Ant-Man stories in Tales to Astonish. But maybe the answer to that is simply that an Ant-Man story - usually only a dozen pages in length - just didn't offer enough space to tell this story in the way Stan & Jack wanted to. 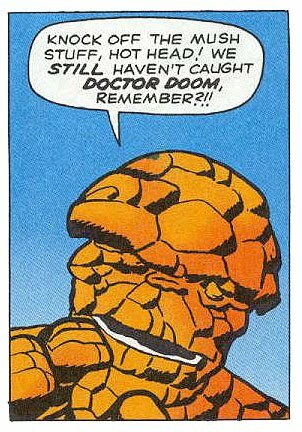 After all, even one issue turns out not to have been enough, as the comic ends with the FF and Ant-Man escaping the micro-world ... but Doom escaping too, and the FF vowing to go after him. 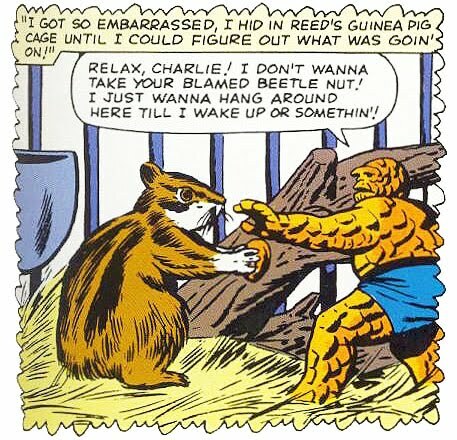 This isn't the first cliffhanger; that would be FF #3, when the Torch quit the team and flew off in a huff, chancing upon the amnesiac Sub-Mariner in the following ish. But that was clearly just a last-page linking device between two very different stories, while this is the first time the reader gets the sense of experiencing a story that was simply too big to tell in a single issue...! would be even more terrifying than normal. And there is a lot to tell in this issue - from contacting Ant-Man, to discovering a hidden world, to helping the royal family which Doom has imprisoned to take back their throne. And yet, as we've come to expect, there are wonderful little details as well. For instance, before they embark on their micro-journey, Reed tracks down Ben at his girlfriend Alicia's apartment to test out a new serum, one that he hopes will be instrumental in someday changing the Thing back to human, permanently. Meanwhile, Sue is grappling with the problem that while she can turn invisible, she can still be identified by creatures with a strong sense of smell, such as dogs, and so is seen experimenting with different kinds of perfumes in an effort to "deaden" her own scent. Even Johnny gets a bit of attention when Pearla, the princess they save from Doom's clutches, sends a few flirtations his way before the FF leave their realm. Any hopes that this could be a potential love interest for the Torch are for naught, however, as Pearla's next Marvel appearance would take 19 years to occur. Benjamin J. Grimm: No Time for Teenage Love!